Aim: The Social Security Institution (SSI) is attempting to standardize intensive care (IC) pricing in Turkey using a package payment system. In our study, we aimed to determine if the intensive care standards of the Ministry of Health can be achieved with the pricing policy of the SSI. 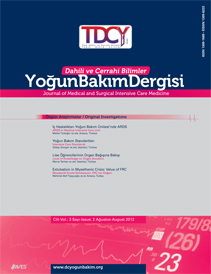 Material and Methods: In this cross-sectional and observational cohort study, the refunds of patients discharged from a level III respiratory intensive care unit in November 2011 was calculated by the method of payment over the diagnosis based on the procedure (package payment system) by applying the Declaration of Healthcare Implementation, which was established on March 25 2010. The standards that were used to determine the levels of intensive care unit (ICU) use were identified. The number of intensive care beds, ventilators and other devices, number of doctors and nurses, working course, length of ICU stay, expected mortality according to APACHE II and actual mortality were recorded. Electricity, water and fuel expenditures were calculated from bills according to intensive care unit square meters size during study period. Additionally, the costs telephones, medical supplies, consumables, drugs, examinations, working doctors, nurses and other personnel salaries, and device repair prices were recorded from hospital bills. Overall income and expenses were compared. Results: During the study period, 22 level III ICU (two single isolation room, rooms with 4+4+6+6 beds) beds, 28 ventilators, 24 monitors, echocardiography, bronchoscopy, an arterial blood gas analyzer, portable X-ray device, and perfusors were present in the level III ICU. The mean length of ICU stay was 6.4 day for 87 patients in November 2011. The expected mortality ratio according to the median APACHE II score of 22 was 39%, but the actual mortality rate was 18.4% (n=16). Twenty-five patients were discharged home and 46 patients were discharged to the ward. Mechanical ventilation was applied to 37 patients (42.5%) invasively and 63 patients (72.4%) non-invasively, for a total of 479 days. According to improving the clinical level of an ICU stay, the income was 313.464 TL and expenses were 278.681 TL. An overall income of 34.783 TL was obtained. Conclusion: It is not possible to build a new ICU hat meets the IC standards of the Ministry of Health with the existing pricing policy of SSI. On the other hand, the management of an intensive care unit currently possessing these standards can be partially achieved.